-Routinely sleeping less than 6 or 7 hours a night increases your risk of cancer by 50%. -Every species every studied, preceding the emergence of vertebrates even, sleeps. Some species can sleep with only half their brain (!!). Sleep is an incredibly risky thing for an animal to do because you are completely vulnerable to predators when you sleep. But sleep is THAT important that it was preserved by evolution. -After even one night of less than 5 hours of sleep, natural killer cells (which kill cancer cells that appear in your body EVERY DAY) drop by 70%. Just one night!!! Buy it, read it, and then share it with everyone you know. 5.0 颗星，最多 5 颗星Excellent book on improving your sleep and why that's important! I love this book! As a life-long poor sleeper, I've read dozens of books that supposedly held the answer to solving my sleep problems. None have, until now. The author not only gives you lots of ideas on how to get a better night's sleep, he tells you why it's so important to get in your nightly 8 hours. Who knew there were so many areas of life impacted by sleep, particularly the lack of it! There is a lot of information here, all of which I found very interesting and quite helpful. At the end of the book he lists a number of ideas that you can put into use immediately. I have seen a great improvement in the quality and amount of sleep I'm getting now, so I feel very comfortable about recommending this book. I am an editor for one of the most visited natural health sites and as such had an opportunity to review a prepublication copy of this excellent book. Sleep is one of the most under rated health strategies and if you haven’t ever taken a deep dive in how to understand and optimize your sleep this is one of the best resources out there to optimize your sleep. Are you tired? If your answer is yes, it would seem relatively straightforward to assume you're not getting enough sleep. Yet, signs of sleep deprivation may not always be this obvious (and there are other factors besides sleep loss that can make you feel fatigued). Dr. Walker does an outstanding job of helping you understand the mystery of why we sleep and unravels some of it mysteries, like why your brain shuts down motor control to your muscles during the most active part of sleep, REM sleep. During REM sleep, there is a nonstop barrage of motor commands swirling around your brain, and they underlie the movement-rich experience of dreams. Thankfully Nature tailored a physiological straitjacket that forbids these fictional movements from becoming reality which protects you from harming yourself. Your brain paralyzes your body during REM sleep so your mind can dream safely. Dr. Walker also consults for many professional teams and helps their athletes understand how sleep is one of the most sophisticated, potent, and powerful—not to mention legal—performance enhancers that has real game-winning potential. Sleep can radically reduce career or season ending injuries and massively improve performance if optimized correctly. On the downside he reviews the dangers of what most of us do every night. Not sleep enough. This coming week, more than 2 million people in the US will fall asleep while driving their motor vehicle. That’s more than 250,000 every day, with more such events during the week than weekends for obvious reasons. More than 56 million Americans admit to struggling to stay awake at the wheel of a car each month. As a result, 1.2 million accidents are caused by sleepiness each year in the United States. You may find it surprising to learn that vehicle accidents caused by drowsy driving exceed those caused by alcohol and drugs combined. And if you happen to be drinking or using drugs the results are not additive but synergistically exponential radically increasing your risk of an accident, injury or death. These are only a few examples of the highly useful information you will receive by reading this book. Highly recommended. 5.0 颗星，最多 5 颗星The importance of restful sleep examined in excellent book. Sleep isn't just about rest. It's about the body repairing itself, doing maintenance so to speak. 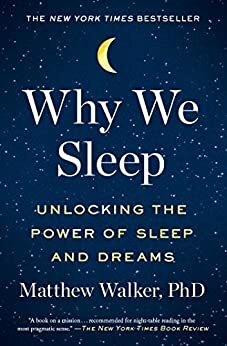 Unfortunately, what has been discovered over time (and discussed in this book) is that, if you lose sleep, taking a nap, while it takes the edge off, it doesn't replace the sleep lost during the night. Our ability to fight disease (including cancer) and obesity may be directly tied to not getting enough restful sleep. Pills don't help either. Yes, they knock you out and make it easier to fall asleep but they lack the restorative power of natural sleep and, in fact, some sleeping pills can increase your risk of cancer. All of this is revealed in this excellent book that focuses on the role of sleep for humans (and, no doubt, also for animals as well). Our sleep cycle is essential to our health and breaking it up or altering it drastically, works against us and makes us less sharp. "Why We Sleep" does a fine job of addressing these issues and explaining the research that has discovered the role of sleep and why it remains an important part of our health. Keep in mind that this book doesn't provide much in the way of solutions for patients beyond general recommendations for "sleep hygiene" as solving the problem really should be done by local sleep physicians (and each individual will have possible different solutions). Given that we spend about one third of our lives asleep (if we're lucky), it's natural to wonder why we sleep - indeed, why every animal sleeps. It's also natural to wonder what happens when you don't get enough sleep. Well, you need look no further for compelling answers to these fundamental questions. Simply put, this is a tour de force of the world of sleep: accessible to a broad audience, beautifully written, and absolutely fascinating. The author has a way of making the science come to life with thought-provoking stories and analogies. He has so thoroughly convinced me of the importance of a good night's sleep that the only reason I put the book down at night is to make sure I get one. I recommend watching an interview or talk by Matthew Walker for inspiration, and then diving into his book.